Infused with Vitamins C and E, this Perricone MD OVM 'Day Treatment' is scientifically formulated to keep signs of ageing at bay. It's blended with revolutionary Eggshell Membrane, renowned for plumping and radiance-boosting properties, so it'll firm and nourish your skin and help smooth out fine lines. Use yours daily to ensure a supple and youthful visage. Aesop takes an all-natural approach to hygiene, and this aluminium-free deodorant spray typifies the ethos. Formulated with 11 nourishing essential oils such as soothing Eucalyptus and Tea Tree, the clear-drying mist is designed to neutralise odour and refresh skin. Deep, woody Vetiver is one of the strongest top notes and leaves a subtle, sophisticated fragrance. Formulated with thermal spring water from French spa town Castéra-Verduzan, the natural Sulphur in this Buly 1803 toothpaste is renowned for its soothing anti-bacterial properties. It's sweetened with Orange and spiced with Ginger and Clove for a powerfully cleansing flavour. Byredo's 'Suede' scent balances notes of fresh Pear and citrusy Bergamot with powdery Violet, Green Lily of the Valley, heady Musk and sweet Plum. The blend gives this hydrating hand wash a stimulating fragrance, which leaves hands feeling clean, soft and smooth. Opening with musky Bulgarian and Turkish Rose and grounded by woody base notes, Maison Francis Kurkdjian's 'Oud Satin Mood' fragrance takes you on an olfactory trip to the exotic east. This rich Eau de Parfum deepens to reveal scents of Patchouli, Vanilla and Violet, rounded off with notes of Siamese Benzoin and Laotian Oud. HR23+ is designed to prevent hair loss in men and women who suffer from early stages of balding and thinning hair. HR23+ is a safe yet potent supplement that i already the fastest growing product of its kind in Europe. This superb supplement contains an effective blend of key hair beneficiary ingredients that act at the root of the cause. 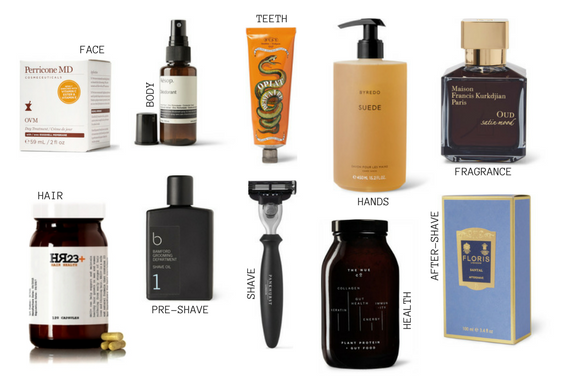 Get a close, nick-free shave with Pankhurst London's refillable razor. It's ergonomically designed with a lightweight easy-to-grip handle and can be refreshed with a quick change of cartridge when the blades begin to dull. Add a dash of luxury to your daily routine with this fragrant and soothing aftershave by Floris. Woody Cedar and Sandalwood complement crisp Bergamot and Lemon Zest and base notes of Frankincense and Musk add warmth and depth. This expertly developed formula contains the natural astringent Witch Hazel, which helps close the pores, and moisturising Glycerine promotes optimum skin health.